The Galway Masters are delighted to announce their chosen charities for the 2016 basketball tournament are Voices for Down Syndrome Galway and the Galway Hospice Foundation. The 6th International Galway Masters tournament takes place on Saturday 5th & Sunday 6th November 2016 in the NUIG Kingfisher. New York Knicks NBA player Charles Smith will compete at this year’s tournament. The 6’10’’ American from Bridgeport, Connecticut played with the famous New York Knicks in the 80’s and 90’s before injuries ended his professional playing career in 1997. Smith also represented the USA national team twice, once for the 1986 World Games in Spain (he led the team in scoring) where he won a gold medal, and the second at the 1988 Olympics in Seoul winning a bronze medal for his country. ‘We couldn’t believe our luck when Charles contacted us’, said James Hanley, of The Galway Masters Basketball Association. ‘He heard about our tournament while playing in Europe and when he found out that it was run in aid of two local charities, agreed to attend and play for Galway at his own expense!’. Charles Smith is no stranger to charitable work having founded the Charles D. Smith Foundation and Educational Centre in 1989, aimed at keeping inner-city children off the streets and improving their educational prospects. The two day Galway Masters International Tournament has become an annual event since its inauguration in 2011 and this year, 33 men’s and ladies teams from Ireland, United Kingdom, Spain, France, Croatia, Scotland, Italy, Serbia, Slovenia & USA will compete to raise money for this years nominated charity’s, The Galway Hospice and Voices for Downs Syndrome Galway. Masters Basketball is played by men and ladies in two divisions, over 40’s and over 50’s, with equal emphasis on the social as well as competitive side of basketball. Bernard O’ Byrne, CEO of Basketball Ireland said ‘The Galway Masters has quickly grown from a simple idea as a social event into a major event in the basketball calendar. It still has a great social side to it but it crucially serves the sport by bringing people back in touch with the game and each other. 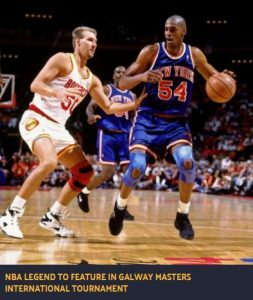 I wish it continuing success.’ As part of this year’s tournament, which is supported by Galway City Council’s Community Tourism Diaspora Initiative, the Galway Masters are running a free basketball camp for boys and girls aged 10-14years. The Head Coach will be NBA player Charles Smith supported by the Head Coach of the NUIG Super League ladies team and Galway Masters Chairperson, Mike Murray. The event will take place on Thursday 3rd November at the NUIG Kingfisher starting at 6pm and Charles will be available to sign autographs after the session. The two day Galway Masters Tournament will begin at 9am on Saturday 5th November at NUIG Kingfisher, admission is free. TEA PARTY & BAKE SALE INVITATION – 23rd October Benefit Concert – Nov 19th.